This morning was rough. I convinced myself that Brambo was punishing me for returning to work. We decided to put him in his crib one feeding earlier, which last night put him there at about 9:30 (yes, we usually don't put him "down" for the night until 11:00 or 11:30). We were unsure about how this would turn out and assumed he would wake us up to eat around 3:30 or so as that would be his normal 6 hour stretch. However, we actually had to wake him up at about 5:45 so that I could start getting ready for work. This was my first Monday and my first day trying to get there at normal time. So he slept for over 8 hours. And let me tell you, the milk was ready and waiting on him. I was so beyond engorged. I should have foreseen the issues, but did not. So he had difficulty latching on from the very start due to my massive br.east and the steady stream of milk that was spraying. After I finally got him latched, I began using my manual pump on the other side. He soon started popping off, I believe because there was so much milk coming out. I was trying to keep the manual pump suctioned so I wouldn't lose any milk and we were just struggling. Fairly soon, he just started screaming. I gave up on the pump and tried switching him to the other side which by this point was more under control. I wouldn't even try to latch. Just screaming. Max came in to help. He got him calmed down and we tried again. Screaming. Calmed down again and tried again. Screaming. By this point I was crying. I then remembered that I had forgotten to give his Za.ntac last night. Bad mother. So we gave him medicine and I rocked and sang him back to sleep. He slept like that for about 30-45 minutes and began to stir a bit so we tried again. And he latched on no problems and ate a quick breakfast. So in the end, all was well. But in those minutes where he was screaming and absolutely refusing to even try to eat, I was miserable. I just knew he would never nurse again. He could somehow sense that I was abandoning him for my job and he decided that he just didn't need me like that anymore. It's amazing to me that I've been thinking I am so well adjusted and doing well with going back to work. At the first sign of trouble, my emotions and crazy brain go straight to those "mom guilt" thoughts. In the light of mid-day and a few uplifting hours, I know it was just a weird combination of things that caused him trouble this morning and that it doesn't really matter because he was comforted and fed and loved. But in the height of emotion, I decided I was a failure. 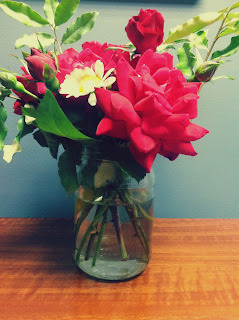 When I finally got in to the office, I found a mason jar of flowers waiting for me that a friend across campus had cut from her yard. It included a sweet note about how she knew this week might be tough but she is thinking of me and is happy to have me back. In a quick email exchange she shared some stories about her first week back from maternity leave and reminded me that I am not alone. I am not the first mother to return to work. It is ok that I am here. It is even ok that I enjoyed being at work on Friday. When I see him in an hour, I will get a giant smile and we will nurse the afternoon away. And I will come back to work tomorrow and all will be well. I'm very sorry for the traumatic hiccup. Couple of wins though: 1) Brambo slept for 8 hrs!!! (that's a big win) and 2) you were able to recover following the Zantac and some more sleep. So, don't beat yourself up. You're doing the best you can while readjusting to work. It will take some time. But it's clear you're doing awesome, so hang in there. Sounds like you are doing great. Hang in there...it gets easier! I love the flowers in the mason jar. How sweet. I imagine what you are going through is completely, 100% normal. I hope it gets easier soon. And again, keep writing about this honestly. It's helpful for the rest of us to read. A rolling count of how many paper sheets I have huddled under in the quest for a baby.